Each month Digital Signage Connection asks their members of the DSE Advisory Board a question of the month. 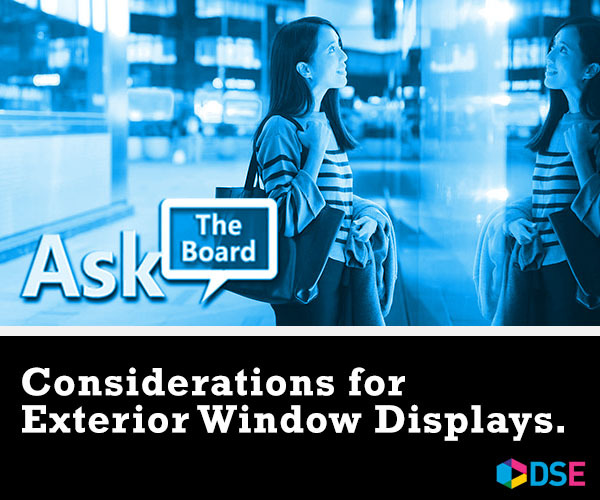 This month, the question focuses exterior window displays. Here is a response from ClockNine’s Chief Creative Officer, Travis Kragh. What should be considered when planning advertising on exterior facing window displays? Dwell time is an important thing to consider when planning ads for exterior facing window displays. Understanding your consumer dwell time will help you craft better content that is more likely to connect and create a reaction. If you find you have a small window to communicate, here are a few suggestions to consider. 1) Simplify Messaging & Word Count. Our time to connect is limited, so it is important we keep our copy short, concise and to the point. Don’t over communicate. Try to simplify your copywriting and get your message across with as few words as possible. This allows people to process your marketing much more quickly and easily. If you find yourself asking “is this text too small?” it probably is…bump it up a few points. 3) Valuable Information ALWAYS on Screen. Keep your most important information on the screen at all times. This way even if someone only sees a second of your content you still have a chance to make an impact. 4) Design a Poster with Motion, Not an Animation. Rewire your brain to think of your content as a poster with motion. Use movement sparingly and strategically to guide the eye to key areas of your design. Simplifying your animation and using motion with purpose will help you communicate more clearly in busy environments.